* See Detailed Description for FDA qualified health claims. EDEN Short Grain Brown Rice Flour is useful for those seeking a gluten free wheat alternative, as brown rice flour is gluten free. People with gluten sensitivity use it in making bread, cookies, and pastries. It can also be used as a coating or dredge for baked and deep-fried foods, and in making sauces and gravies. sauces, gravies, and as a dredge (sprinkle) for baked and deep-fried foods. Used with other flours it makes great pasta and baked goods. For crispier deep-fried vegetables, fish, or shellfish, combine brown rice flour with wheat flour when making tempura batter. Brown rice flour imparts a nutty flavor. Experimentation is recommended to determine proper proportions and appropriate uses. USDA Human Nutrition Research Center at Tufts University say, "Whole grain regulates blood sugar by slowing down the conversion of complex carbohydrates to sugar. In fact, low-glycemic food such as whole grain reduces hunger and can help to control weight." Agriculture Research Service did a study of more than 2,000 people concluding, "at least three or more servings of whole grain everyday could reduce the chances of developing metabolic syndrome - a condition marked by a combination of abdominal obesity, high blood pressure, poor blood sugar control, low HDL 'good' cholesterol and high blood fats." According to FDA, "Diets rich in whole grain and other plant foods and low in total fat, saturated fat, and cholesterol may reduce the risk of heart disease and some cancers." 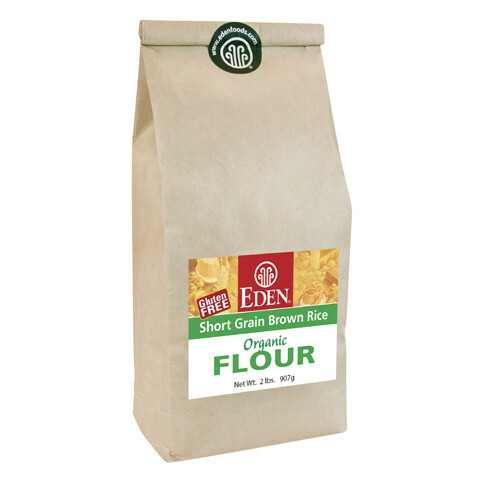 EDEN Short Grain Brown Rice Flour is 100% whole grain, low in total fat, and free of saturated fat and cholesterol.